Hey, I think I may have read the strip where you got your avatar this morning. Was it the one in the haunted house, where all the Mister Bigglesworths were pretending to be ghosts? I like your avatar. Looks kinda familiar. I liked TwoKinds a bit, haven't checked that in quite a while though. I might check Housepets out sometime. 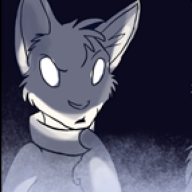 I'd also recommend catching up on TwoKinds. It's one of my favorite webcomics. Darn it Jonesy every time I see you comment I found a webcomic I need to read. Also good choice of avatar Fawx.